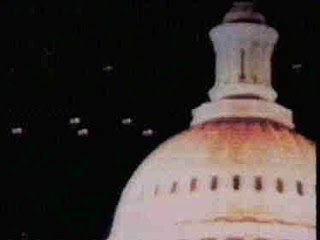 A really important ufo case is the 1952 washington DC event, It started with a National Airlines crew sighting on July 13th, about 60 miles SW of the city, and then continued for a week, with more sightings , even a fleet over the whitehouse - all with radar confirmations! 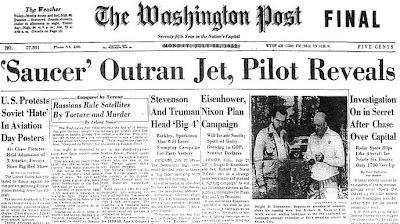 It started again on the 25th, this time with Air Route Traffic Control radar picking up numerous UFOs (and multiple such incidents that day), and another National Airlines crew sighting. This continued this time for 4 more days, through the 29th. Was this ever resolved by the government? How can something like this not grab people's attention? ALSO: Is it just me or have the videos released in the past 6 months...and not just one here, been more "open" and of better quality? Maybe the truth is making its presence known in a more direct way...since the government still isn't saying anything. This is not an authentic video - they were not colored in 1952. And the voice of Truman sounds additionally synchronized. The military industrial complex (or 'the government'), which are the folks who are sitting on this info, are not going to disclose zilch even when it could save planet earth (or the entire universe for that matter) from imminent destruction. The only way for this info to get disclosed is to make them superfluous; meaning, we go *over their heads* and make contact with the ebens ourselves! We have never needed them, and never shall, to be able to do that! Whenever contact is made I am sure it will be at the discretion of the visitors and not us. They do seem to have the advantage of the high ground. The objects described in this video remind me of the clusters of bright orbs sighted in Mexico, and at other sites in South America. When I see these objects on film I think of a school of fish, or a flock of birds cruising by. After seeing some of the NASA tether footage as well it would not surprise me if these things are alive. BTW, thanks for the effort you put into this site. I don't want to confuse these orbs with the remote controlled ones that are obviously used by our visitor pals when they want to make crop circles. These guys will be the ones that oversee this planet and make sure we don't get off of it. Very interesting that this event is never the point of focus for the proof of life beyond mankind. How much proof do you need? Instead we send a probe to Mars to look for living microbes - how pathetic... sad really. 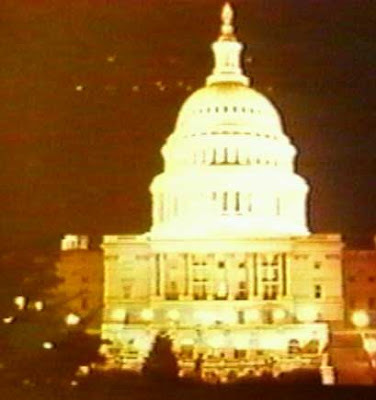 Isn't this the CAPITOL rather than the White House ? i really can't see these lights as being merely reflections. Especially when they were caught on radar over a two week period. Besides, i'm sure i heard that there was actual footage taken of them, although i may be wrong. I'm sure someone will be able to tell me on here. your Mum is sooo sweet ! Do your research; color film did exist in 52 and was available on the consumer market. Well I can only laugh, yeah? 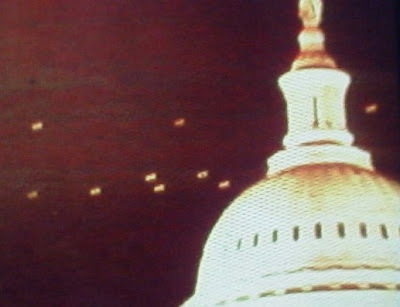 UFO SPOTTED FLYiNG OVER THE WHITE HOUSE! The OBAMA ADMINISTRATION is being MIND-CONTROLLED by ILLEGAL ALLIENS from OUTER OF SPACE! EVERYONE in the OBAMA ADMINISTRATION is BRAIN DEAD! THEY ALL SAY-I DONT KNOW! WOW the really SCARY thing is that these AZZHOLES who don't know nothing are actually in Charge of Protecting U.S. and our CIVIL RIGHTS! INTERESTINGLY, NO ONE IN THE NIXON ADMINISTRATION KNEW ANYTHING EITHER, but now we KNOW that NIXON was LYING to U.S. and he received his so-called "JUST DESERTS", just as PRESIDENT BARACK OBAMA will sooOOOOOON BEGIN TO REALZE! GOD's WORD specifically implies that, "We shall REAP, whatever we SOE"! ... by that STANDARD I Suspect that Barack and his Ship Mates are Sinking into some really DEEP $HYT! REQUEST: In the FUTURE I Recommend that ANYONE from the OBAMA ADMINISTRATION that uses the TERM "I DON'T KNOW" should be HELD in CONTEMPT by the United States of America! FACT: PRESIDENT BARACK OBAMA Knows the TRUTH, the WHOLE TRUTH, but CHOOSES to MISLEAD U.S. during the HOTT sUMMER of 2013! Are you ready for 2012 ? Rods over stirling City ? Why do some ufos appear as black rings?